The EASD PAWS…and Think Club won 3rd place out of 34 HS entries at the NJM Just Drive Contest! 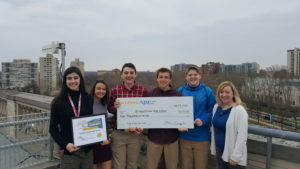 The top winners were announced on April 5, 2019 at the Franklin Institute in Philadelphia. The Club brought home a $5,000 prize for 3rd place. Congratulations to the students! 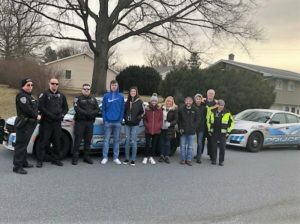 When Elizabethtown Area High School’s (EAHS) PAWS…and Think Club entered a “Just Drive’ Public Service Announcement (PSA) video contest in November 2018, students knew they wanted to focus their efforts on showing the possible outcomes of distracted driving. 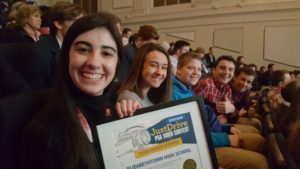 Contest sponsors are NJM Insurance Group, SADD Pennsylvania, Team DUI, and Teen Safe Driving Coalition. Distracted driving is defined as the act of driving while engaging in other activities which distract the driver’s attention away from the road. The Club’s video specifically focuses on texting and driving, and its implications. 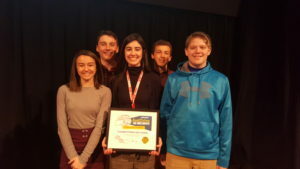 Club members gathered facts on distracted driving, and with the assistance of Madelyn Fanella, an EAHS senior, who is interested in furthering her education in video production, developed plans for video shots. The Club received a stipend from contest sponsors for production costs, and used a portion of the funds to purchase a GoPro, to enhance the video quality. The Club plans to use the camera for future projects as well as loan it to other school clubs. With the storyboard and equipment secure the next step was enlisting first responders. Amy McEvoy, the PAWS…and Think liaison from Elizabethtown Area Communities That Care (EACTC), recruited the assistance of Northwest Regional Police Department and Northwest EMS for the project. Filming took place in early January, at the intersection of College Avenue and Campus Road. With each departments’ assistance and participation, shots were filmed both there and at Northwest Regional’s headquarters. After several weeks of post-production, the completed PSA was submitted to the contest organizers. The top three contestant finalists will be announced April 5, at an event at the Franklin Institute in Philadelphia. Prizes include cash awards and a driving simulator. To view the Club’s completed 30 second PSA and full-length PSA visit eactc.org/patpsa/. PAWS…and Think would like to express their gratitude to Mark Mayberry, Northwest Regional Police Department Chief of Police, and Suzette Kreider, Northwest EMS Operational Director, for their commitment to the project. Both the police department and Northwest EMS plan to use the PSA when informing area teens about the dangers of distracted driving. The PAWS…and Think Club spreads the word about the positive, healthy choices EAHS students are making in their lives. The Club advisor is Ken Boland, the EACTC liaison is Amy McEvoy. EACTC is a community organization committed to improving the lives of children, youth, and families in the Elizabethtown area. Using research-based programs, initiatives, and strategies, the organization guides and encourages youth in making positive choices about alcohol, drugs, and other high-risk behaviors. EACTC partners with the schools, parents, churches and businesses to make positive changes in the community. Pictured left to right: Officers Whitebread, Bryant and Tobias; Chip Stambaugh, Madelyn Fanella, Chloe Garner, Amy McEvoy, Ken Boland, Chaz Mower, Julian Richer, and Suzette Kreider.